After Thursday's close, Amazon posted Q4 2015 earnings per share (EPS) of $1, more than double the year-ago quarter. Still, that was well short of the $1.58 EPS analysts were expecting. Revenue of $35.7 billion was also shy of forecasts for $35.9 billion. For the full year, Amazon exceeded $100 billion in revenue for the first time in its 20-year history. It took rival Wal-Mart Stores Inc. (NYSE: WMT) 35 years to reach that same milestone. But results from Amazon's lucrative Web Services (AWS) unit were mixed. The unit rents computing power to other companies from a multitude of servers and has a commanding lead on competitors. It posted a 69% surge in sales to $2.4 billion during the quarter. Operating profit in the unit nearly tripled to $687 million. But AWS's revenue growth was 78% slower than in the previous quarter. As Amazon prepares to debut new initiatives, like same-day and drone deliveries, costs are rising. Operating costs rose 20.5% to $35.6 billion from $28.7 billion last year. Shipping is one of Amazon's biggest attractions, yet it's also one of its biggest expenses. As a percentage of sales, shipping costs jumped to 12.5% from 10.9% year over year (YOY). Guidance for Q1 2016 was mostly in line with analysts' projections. Amazon said it expects to make $26.5 billion to $29 billion in sales for the current quarter. The company sees YOY growth up between 17% and 28%. The consensus estimates are for sales of $27.7 billion. Amazon stock was the top performer in the broad-based S&P 500 Index during 2015. And even with today's drop, the Amazon stock price is up 84% in the last 12 months. Shares more than doubled in 2015, climbing a blistering 122%. Driving the Amazon stock price was it Prime membership, which offers two-day shipping for a $99 annual fee. While a number of analysts lowered their price targets on Amazon following Q4 results, we remain upbeat on the Amazon stock price. At $577.81, the Amazon stock price is down 14.51% year to date. That coincides with an 8.6% drop for the Nasdaq during the same time. 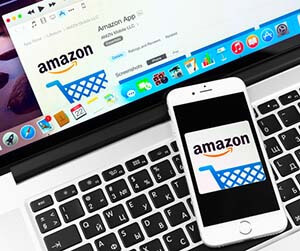 Amazon stock may remain volatile in the short term because of the broader market's volatility, but for long-term investors, Bezos' vision for the company is encouraging.